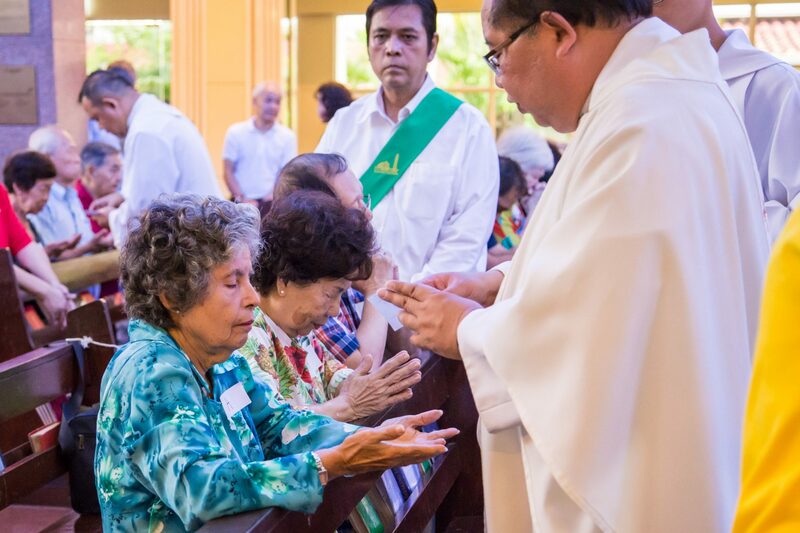 This sacrament helps unite those who are suffering with Christ’s saving and healing power. Through this sacrament, people who are very sick receive forgiveness for their sins and comfort in their suffering; they are restored in spirit; and sometimes, even experience the return of physical health. Although suffering is a part of life, Christ unites our suffering with His passion and death so that through our suffering, we can participate in His saving and healing work. In the Sacrament of the Anointing of the Sick, the priest anoints the seriously ill, injured, or the elderly with the oil of the sick. This is a special oil that was blessed by our Archbishop at the Chrism Mass during Holy Week. The priest anoints the sick person on the forehead, saying, “Through this holy anointing may the Lord in his love and mercy help you with the grace of the Holy Spirit. Amen.” He also anoints their hands, saying, “May the Lord who frees you from sin save you and raise you up. Amen.” The “raising” refers to spiritual healing, as well as any physical healing that may take place. The person is also often offered Holy Communion. This is Viaticum, food for the journey and preparation for passing over to eternal life. This sacrament can be administered to any Catholic who is seriously ill. Caregivers should not wait until the patient is critically ill or when death is imminent to notify a priest. Parishioners who are going for major surgery can also arrange to see the priest before their surgery for this sacrament. Do contact the Parish Office and leave your name and number, the priest will contact you thereafter. Priests from the churches closest to the hospital are usually available for any hospitalised Catholic who needs a priest’s help. In cases of emergency, when a patient is in need of the Anointing of the Sick and a priest from the nearby church is unavailable, any priest who receives a call will go to the hospital or look for a replacement if he is unable to do so.